Gold is up 18.82% year to date and heading even higher. That why we've got the four best gold stocks to buy now in June 2016. Before we get into our favorite gold stocks to buy, here's what will continue to drive gold prices this month and beyond. One of the biggest catalysts for gold prices was last month's dismal jobs report, which showed U.S. employers only added 38,000 jobs in May. That caused the odds of an interest rate hike in June to drop dramatically. In fact, there's virtually no chance the U.S. Federal Reserve will increase interest rates when policymakers meet on June 14-15. Markets are placing 4% odds on a rate hike this month. For July, odds have dipped to 36% from 42% before the jobs report. For September, chances of the Fed raising rates are 51%. The ugly jobs reports, subpar economic growth, and low inflation all have analysts expecting more dovishness from the Fed. In fact, BNP Paribas doesn't see the Fed raising rates until 2018. And that low interest rate environment has sent gold prices surging in June. 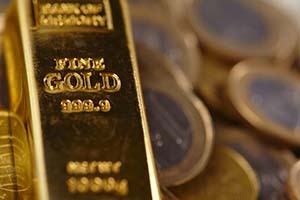 Fears of the UK leaving the European Union have also stoked gold demand. Voters head to polls on June 23 to vote on a "Brexit." A UK exit would rattle global markets, cause trade imbalances, and fuel worries that other countries might follow. The growing use of negative interest rates and negative yields has also driven gold prices higher. An estimated $10 trillion of fixed-income securities have negative yields currently. Corporate profits continue to fall. The estimated earnings decline for the S&P 500 Index in Q2 2016 is 4.8%, according to FactSet. If the broad-based index reports an earnings decline for Q2, it will mark the first time the index has recorded five consecutive quarters of year-over-year (YOY) declines in earnings since Q3 2008 through Q3 2009. Slowing growth and inflation in China are ongoing concerns. Data out Thursday showed consumer inflation rose 2.0% YOY in May, compared with a 2.3% rise in April. The falling inflation rate has many believing China's central bank will introduce new economic stimulus measures. Higher gold prices have translated into huge profits for the world's largest gold mining companies. So much so that miners have become the new stock market leaders. "As the return of the gold bull looks more and more entrenched, gold producers will be first in line to reap the biggest gains," Money Morning Resource Specialist Peter Krauth said. "They've already started." The best gold stocks to buy now have already posted impressive year-to-date gains, but still have room to run. Barrick Gold Corp. USA (NYSE: ABX) is a Toronto, Canada-headquartered company engaged in the global production, exploration, and mining of gold and copper. The company has also sharpened its focus on reducing its debt, which is another positive catalyst. Looking ahead, execution of project developments could be key for Barrick and lead to further upside for its shares. Barrick is a top holding among several hedge funds. On May 16, updated 13F filings revealed the Soros Fund's new positions include 19.4 million ABX shares. ABX closed out Q1 with an 84% gain. At $19.14, ABX is up 164.5% year to date. That's up nearly 46% from where we first recommended it. AngloGold Ashanti Ltd. (NYSE ADR: AU) operates as a gold mining and exploration company. The company also produces silver, uranium oxide, copper, and sulphuric acid. Its portfolio includes 17 mines in South Africa, Continental Africa, Australia, and the Americas. The company's strengths can be seen in multiple areas, including its solid stock price performance, impressive record of earnings per share growth, and increase in net income. RBC Capital Markets recently upgraded AU to "Outperform" from "Sector Perform." The firm believes AU represents the most robust opportunity in its South African coverage, supported by a diverse, low-cost asset portfolio. At $16.88, AU is up 137.61% year to date. Newmont Mining Corp. (NYSE: NEM) develops, explores for, and produces gold, silver, and copper in the United States, Australia, Peru, Indonesia, Ghana, and Suriname. The company was founded in 1916 and is headquartered in Greenwood Village, Colorado. After recent non-core asset sales, Newmont is left with high-quality assets with longer mine life. This positions Newmont well for the metals' price environment, which tends to be volatile. An Indonesian consortium is said to be mulling a $2 billion bid for Newmont's assets in the country. At $35.69, NEM shares are up 98.61% year to date. That's up more than 30% from when we featured NEM stock less than two months ago. Goldcorp Inc. (NYSE: GG) acquires, explores, develops, and operates precious metal properties in Canada, the United States, Mexico, and Central and South America. Founded in 1954, the company is headquartered in Vancouver, Canada. Many analysts are bullish on the company because of its strong balance sheet, growth profile with lower-cost new mines, longer average mine life, and a solid dividend yield. Over the last few years, Goldcorp has been altering its mine plans, cutting spending, and disposing assets in order to reduce costs and focus on the most profitable production. At $18.26, GG is up 57.96% year to date.